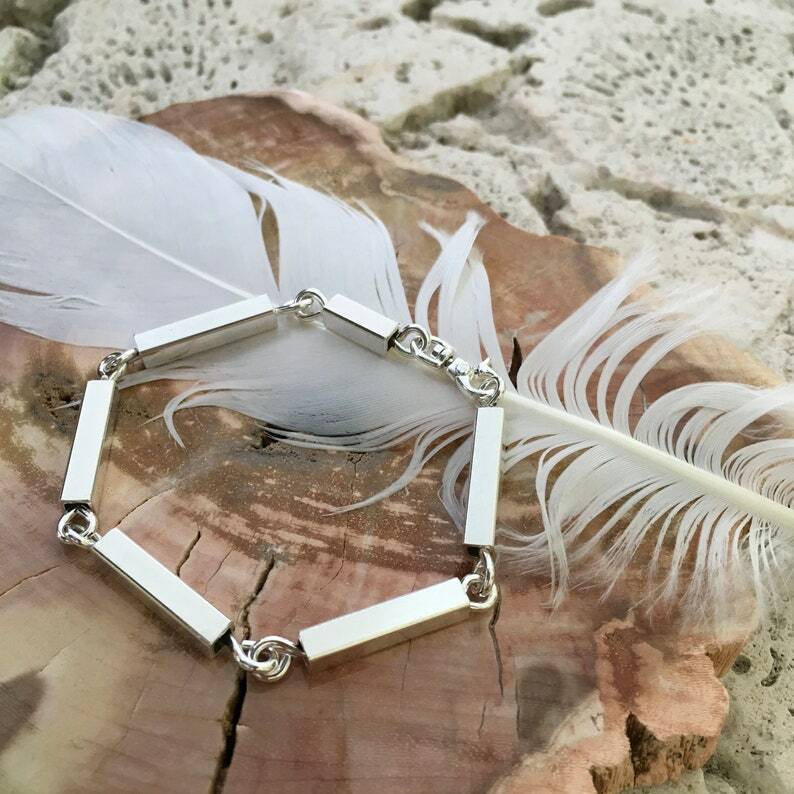 Sterling silver square link bracelet. I call this one “Silver Linings”. Silver linings are those wonderful things we find in some of our darkest times. I hope you always find yours. Each bracelet is hand made to size when you order it. When you give me your size I will adjust the size of each link to be as equal as possible. Each link is made to turn to catch the light with its brilliant polish. A small polishing cloth is included as a small thank you for your purchase. Each square link is hollow but substantial and the one shown fits a 6 to 6-1/4 inch wrist. Size 7 weighs a full 1/2 ounce. The clasp is a swivel lobster clasp. To find your size, measure your wrist and add 3/4 inch for a slight drape. Or take a link bracelet that fits with a regular clasp (not a toggle) and measure it end to end while laid straight. If you are between sizes, order up. If your size is not listed, send me a custom request. To see a video of it on my wrist, check out my Instagram at UntwistedSister. It’s the video with the purple shirt. Follow me on Instagram to get prelisting prices and first looks at new work. Can also be customized with a bead or crystal between the links. Etched copper cuff bracelet. dandelion patterned bracelet. Size small.